For many decades, the Kingdom of SaudiArabia remained, due to its almost indefinite oil reserves and its important geo-political location, one of the key-players on the international economical and political stage. At the same time, stringent immigration and visiting procedures wrapped the country in a (esp. for Western standards) ‘fascinating’ veil of secrecy. Covering a desert-filled area of some 2,24 million square kilometres and possessing a quarter of world’s known oil reserves, SaudiArabia succeeded in combining its traditional Islamic religion and economical prosperity for its rapidly booming population. This boundless desire and quest to safeguard the well-being of future Saudi generations, fine-tuned by basic Islam-traditions (justice, respect, and hospitality..), is nowadays omnipresent at all levels of the Saudi society. The final and lasting achievement of this Saudi objective, shared by almost GCC (Gulf Co-operation Council) Gulf-states, necessitates regional and international stability. Using its predominant geographical size and worldwide eco-political impact, SaudiArabia initiated several peace-initiatives to solve or temper some long-lasting and stability/development-threatening conflict-situations (incl. recent Israeli-Palestine peace-initiative by the Kingdoms Crown-Prince Abdullah). in the Middle-Eastern region. Willing to illustrate its willingness to achieve regional stability, to protect itself from foreign military invasion and fully aware of the psychological (i.e. deterring) impact of a well-equipped and trained army, SaudiArabia used its vast financial (oil-generated) resources to build-up an impressive fighting-force using state-of-the-art equipment. The vastness of the territory and the much-needed mobility in case of crisis triggered a stunning and well-balanced build-up of the Royal Saudi Air Force, flying a mix of high-performance all-weather capable F-15C Eagle, F-15S Strike-Eagle and Tornado IDS/ADV fighter-bombers. 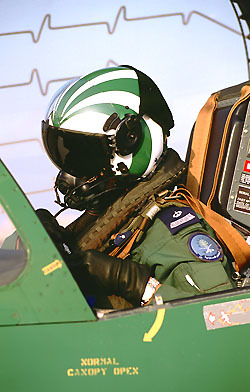 Although RSAF-aircrew participated with success in the UN-backed Desert-Storm/GulfWar operations and were on constant alert during the Iranian-Iraqi War in the eighties, the Chief-of-Staff of the RSAF General Abdulaziz Henaidy, backed by Prince Sultan Bin Abdulaziz (Minister of Defence & Aviation), was looking in 1988 for a more ‘peaceful asset’ to show the capabilities of the RSAF to the Saudi population :　the creation of a RSAF-dedicated demonstration team was imminent. 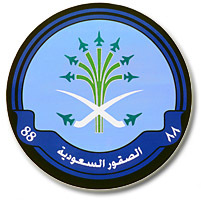 Finally, on 25/06/1998, No.88 squadron was created at King Abdulaziz Air Base (Dhahran) as the official RSAF demonstration team, flying a mix of BAE Hawk Mk.65 and 65A jet-trainers. 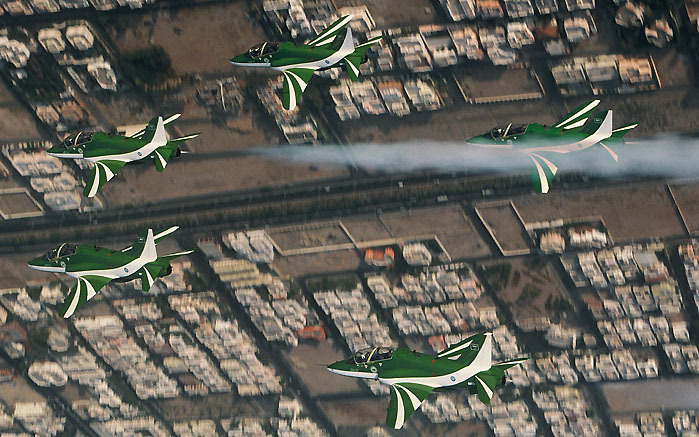 This newly-formed display team, soon be known as the ‘Saudi Hawks Aerobatic Team’, was created to represent the Royal Saudi Air Force during national and international (aviation-linked) events and to show the air force’s capabilities to the Saudi and foreign public. 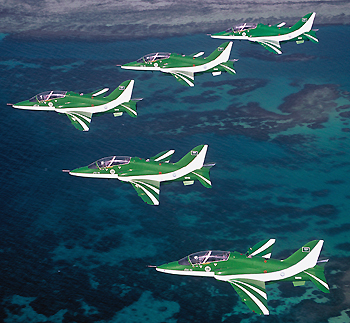 Having selected and trained five experienced Hawk-pilots, the SaudiHawks-team made its official public display debut in January 1999 at Riyadh, the Kingdom’s capital, as part of the 100th anniversary celebrations of Saudi Arabia. From the start six smoke-capable BAE Hawk Mk.65A and three Mk.65’s, all modified by BAE Systems, were assigned to the team, wearing striking green/white demonstration-colours. 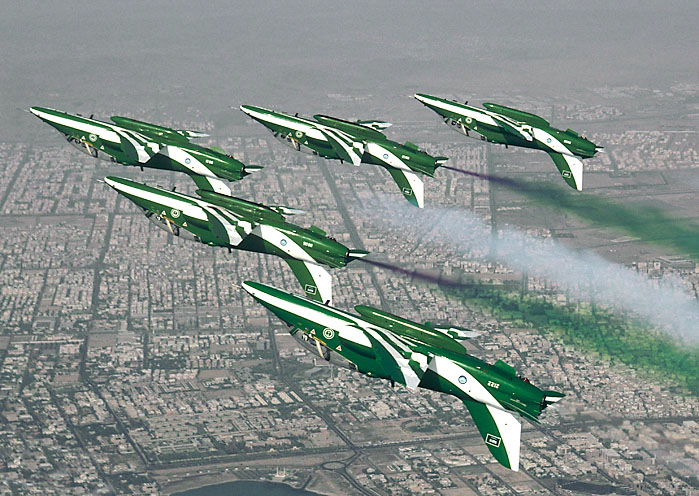 Having performed since its creation exclusively within SaudiArabia, the SaudiHawks made –in February 2000- their first international appearance in Bahrain, flying out of the nearby KingAbdulazizAirBase (Dhahran). squadrons to KingFaisalAirBase (Tabuk) in northwestern Saudi Arabia. The colours of smoke used during the SaudiHawks-displays depends on the type of Hawk-aircraft flown by the various pilots. 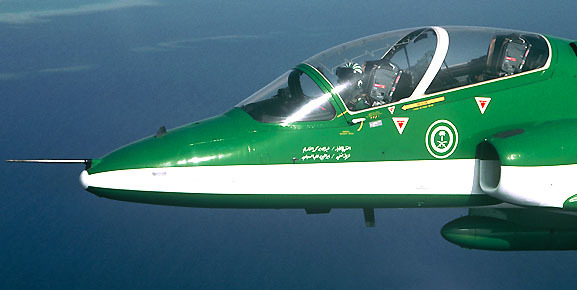 The Hawk Mk.65s, delivered to the RSAF since 1997 under the AlYamamah arms contract with British Aerospace, are only capable of carrying one colour : green, white or red. The ‘more modern’ Hawk Mk.65A-aircraft, originating from the AlYamamah II follow-on contract and modified to ‘smoke capable’ aircraft by BAE before final delivery, carry all three colours enabling the pilot to select each individual colour when required during the display routines. 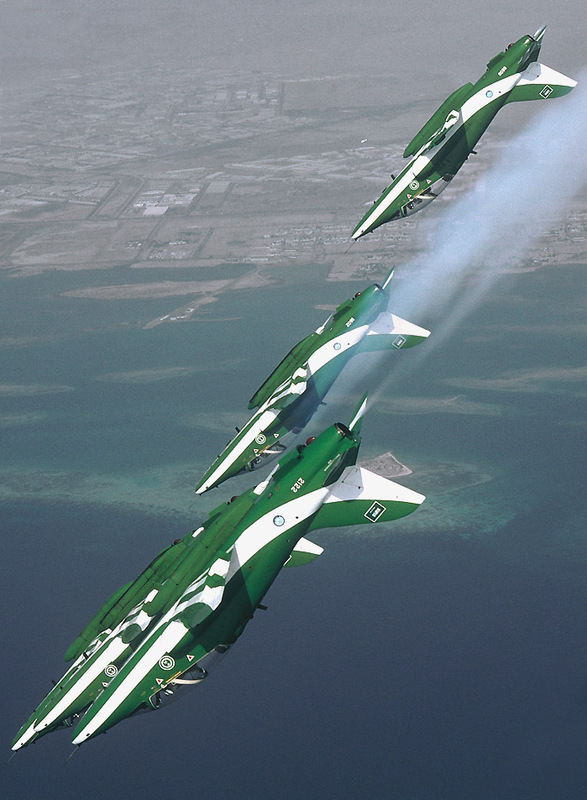 Having flown a much-appreciated five-ship display programme until 2000 and obtained vast support from the RSAF-Staff, two additional SaudiHawks-pilots joined the team for the 2001-season, enabling the integration of a ‘synchro-pair’ flying routine in the team’s ‘seven-ship’ programme. 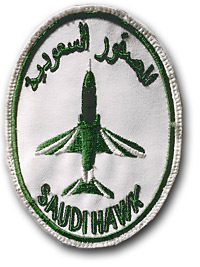 However unexpected pilot mutation within the squadron, forced the SaudiHawks-team to reorganise in 2002 into a –once again- five-ship display team, integrating two new well-motivated pilots and preparing at the same time the forthcoming integration of a sixth (solo) pilot into the team. Later on a seventh pilot will also join the team, allowing a full-size formation and synchro-solo routine. 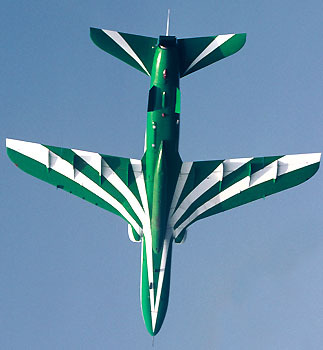 Since its creation in 1998, fourteen pilots joined the SaudiHawk-demonstration team. 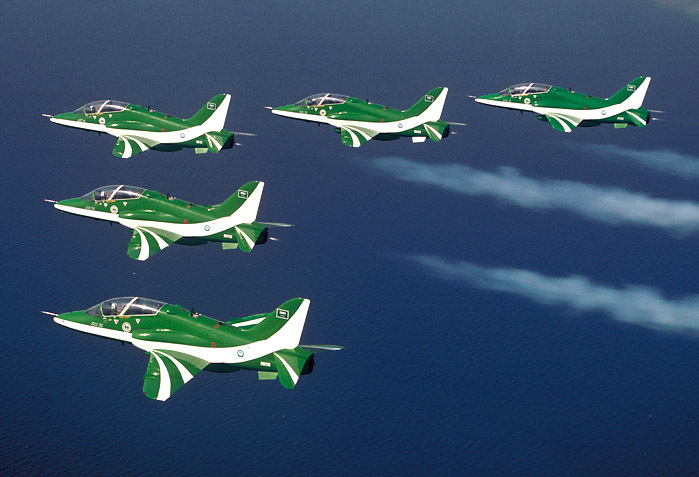 Like most national display teams, the Saudi display team annually rotates several of its team-members, allowing ‘end-of-tour’ pilots to pursue their carreer and new ambitious pilots to bring new ideas into the team. 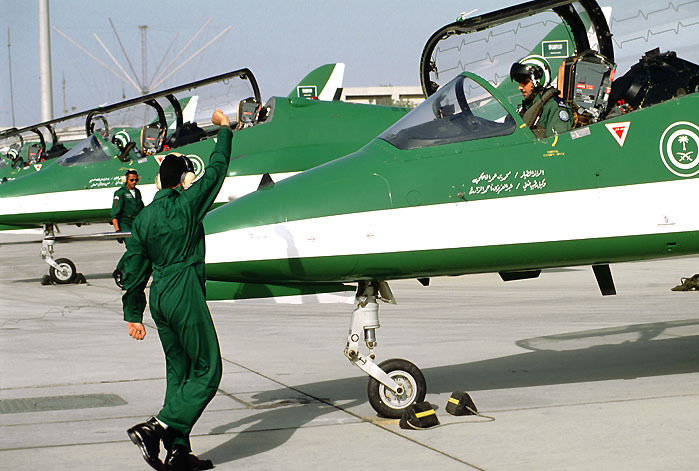 To be able to join the SaudiHawks, ‘new’ pilots need to have at least 1000 hours flight-experience, be qualified as a section/flight leader in their squadron of origin and -most of all- be highly motivated and have the right spirit to join the team. Until now, almost all display-pilots were already part of the RSAF-Hawk community, flying as instructor-pilots on the Hawk Mk.65(A) at Tabuk. Prior to final selection by the SaudiHawks-‘board of examinators’, all candidates are screened during a one-week long flying programme at Tabuk, evaluating the formation-flying and personality skills of the various ‘trainees’. 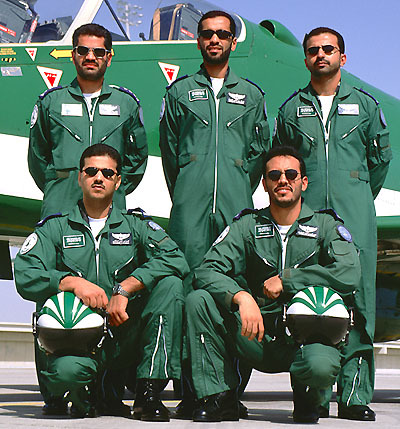 Traditionally, new-born SaudiHawks-pilots are assigned to the No.2 and 3-position in the various display-formations, flying close to the team-leader. For six months –and two/three times a day- the team-leader will train his two two wingmen during a threeship display training routine. These new pilots are assisted and instructed by the ‘old’ No.2 and 3 position pilots flying in the backseat of their BAe Hawk-aircraft. These more experienced pilots, flying in No.2 and 3 position the previous display-season, will later in the training build-up programme move to No.4 and 5 position in the formation-routine. The initial training of the new wingmen takes around twenty missions, including a smooth and gradual ‘altitude’ step-down to the actual 300 feet display altitude. Immeaditely afterwards, No.4 and 5 position pilots are integrated in the flying programme, allowing the main section to train and finetune the first part of the display routine. At the same time the synchro-pilot(s), having already trained their individual routines and being last year’s No.4 and/or 5 pilots, join the formation-training flying ‘trail’ to the team-leader. Once proficient in flying these six/seven ship routines, the team initiates the second part of the training programme, including the time-adaptation of the synchro-solo flying routine to the formation flying of the main section. On general two or three missions, flown by the team leader and the solo-pilot(s), are needed to coordinate and adjust the two individual flying routines. Once entirely satisfied with all visual and timing-linked components of the flying programme, the ‘fully operational’ SaudiHawks-team rehearses the entire display-routine –at display altitude- during an intense one-month long training-programme. Traditionally the four month long display-season start in June, when the team tours around the Kingdom to perform at various national (civil and military) manifestations. 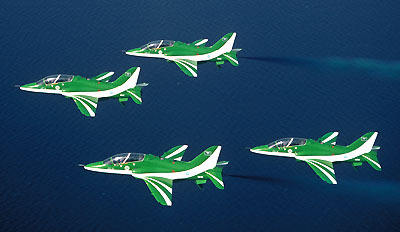 Although the SaudiHawks-pilots visited the 1999 Malta International Airshow, no immediate plans to attend European air shows exist. The big international premiere for the SaudiHawks-team will take place at the 2003 Dubai airshow, by far the main aviation exhibition in the Gulf area. 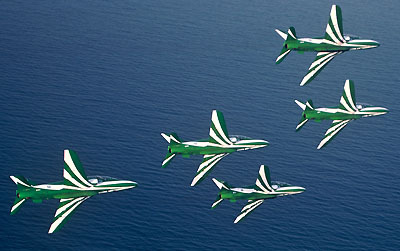 The high standard of formation flying of the 2002-team, the fiery motivation of the new team-members and the vast support by the Saudi population and armed forces will enable the SaudiHawks to gain a similar international and regional reputation as their European counterparts (Patrouille de France, Red Arrows, Frecci Tricollori…).